Is your head scratching? Did you walk through the local drugstore and look at the boxes of over the counter lice treatment options? Notice anything odd about them? That’s right, all of those treatment options include harmful chemicals. These products are basically outdoor bug sprays that you lather into your hair in the hopes of removing lice for good. Well, guess what? They don’t actually work quite well enough to remove the lice completely. We discovered that for ourselves, unfortunately. That is why we now offer a way to remove 99.9% of all lice from your scalp right here in the office with our lice treatment in Cedar Hill, TX. 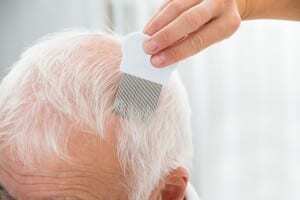 Undergoing lice treatment in Cedar Hill, TX, is probably the smartest option for those with an itchy scalp. We use an all-natural killing agent that was designed to be completely safe for your hair and skin. It removes all of the lice effectively once lathered into the hair by one of our lice removal technicians – who have been trained to removal lice completely. We then offer advice on how to continue treating your scalp at home by using our all-natural products for a period of time, ensuring no more lice sprout up. Our pesticide-free killing agent has been specially engineered, just like our steel nit removal comb, to rid your scalp of lice once and for all. These products work wonders, and have been tested to perform their job effectively. Our Lice Solution Treatment will cost $20 per bottle, while the nit removal comb is also $20. We also sell mint detangler spray, because lice absolutely cannot stand mint. This product is sold for $20. Children are often fearful of what they do not understand, and many have never experienced the discomfort of a head lice infestation. Despite being incredibly common, head lice are still pests that we would all prefer to avoid. When your child does acquire lice from a classmate or neighborhood friend, bring them to Lice Lifters Treatment Centers for prompt treatment. Your initial reaction may be to visit the drugstore on the way home from work, but we advise against this. Your common over-the-counter lice treatment products are loaded with insecticides, which are harmful to children’s sensitive scalps. At Lice Lifters, we use non-toxic, all-natural killing agents and experienced comb-out techniques to rid the scalp of pesky lice. Your child is in good hands. Believe us; we have successfully used the same treatment techniques on our own children! The Centers for Disease Control and Prevention (CDC) estimate between 6 and 12 million individual cases of head lice each year. These numbers are within the United States, among children ages 3 to 11. That is an incredible amount of infestations across the nation. An exact estimate is tough to nail down due to unreported cases, but it’s safe to say that head lice are more prevalent than initially expected. While preventable, we cannot always avoid head lice. Your best bet is to seek prompt treatment from Lice Lifters Treatment Centers. We’ll help solve your head lice infestation in Cedar Hill. If you are after prompt lice treatment, you need to schedule an appointment with Lice Lifters Treatment Centers. We have built our business on reducing head lice infestations and treating those that are already an issue. We work with children and parents who are tired of the itch and discomfort that stems from head lice. Everyone wants a fast, permanent solution, and our all-natural products are guaranteed to provide one! For most, one treatment is enough to resolve a head lice infestation. The first step of treatment begins right here in our office. We start with a thorough head-check, then an expert comb-out, and finally with the application of our non-toxic, all-natural killing agent. After the completion of your appointment, we will send you home with clear instructions for an at-home follow-up treatment. Completing our recommended follow-up steps are crucial, as it helps kill off newly-hatched nits. Head lice can only survive outside of a human head for 24 hours. Still, everyone wants a permanent solution for those still clinging to their hair follicles. Lice are pesky and persistent, and can often spread amongst family members with ease. It takes getting too close to someone just once for the infestation to spread. If you are seeking a permanent solution, Lice Lifters Treatment Centers have a viable treatment program that begins in-office and ends in the comfort of your own home. Not only do we offer all-natural treatment, but we aim to educate parents, too. By visiting the professionals at Lice Lifters Treatment Centers and following our three-pronged approach, we guarantee that you’ll be rid of head lice! If you’re interested in purchasing our products to remove lice at home, give us a call or visit our offices today. We sell them right here in the office, too!